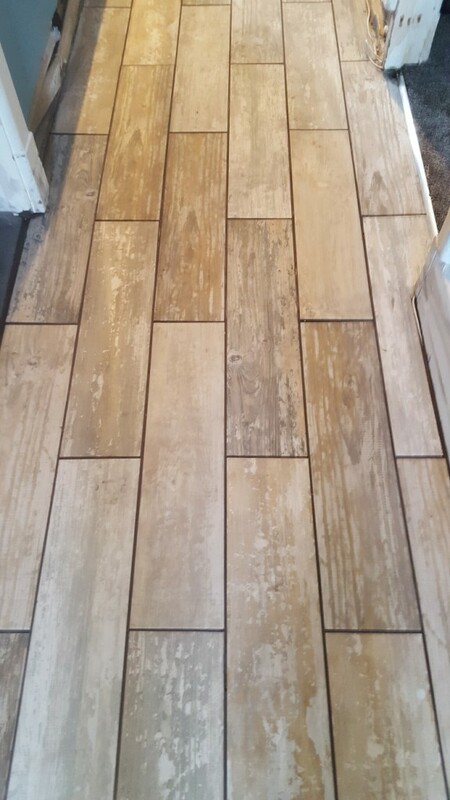 I thought I would do a quick post on this request I received to finish off the grouting of these wood effect Porcelain floor tiles at a house in Homes Chapel. 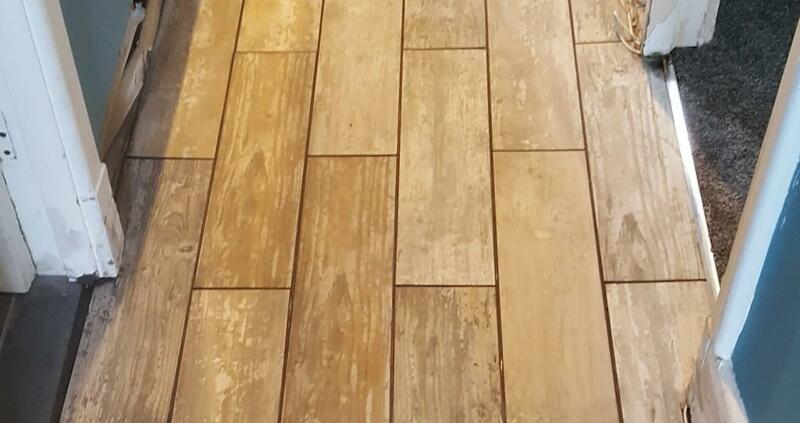 The owner is a DIY enthusiast and had been making some renovations to the property including the laying of this long format distressed wood effect tiles which are really realistic. 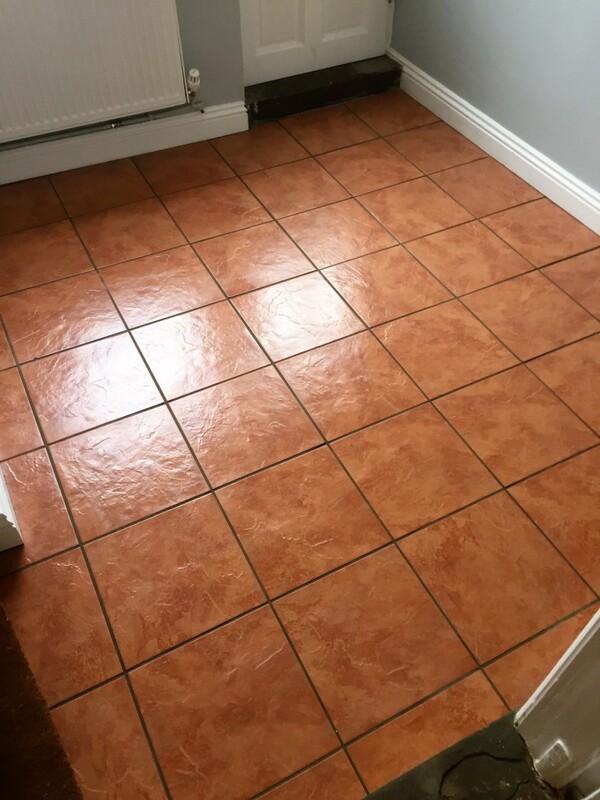 The owner had done a good job laying a level floor but was unsure how to apply the grout so put in a request for some assistance. Always happy to help what ever the situation I popped down and finished the job. 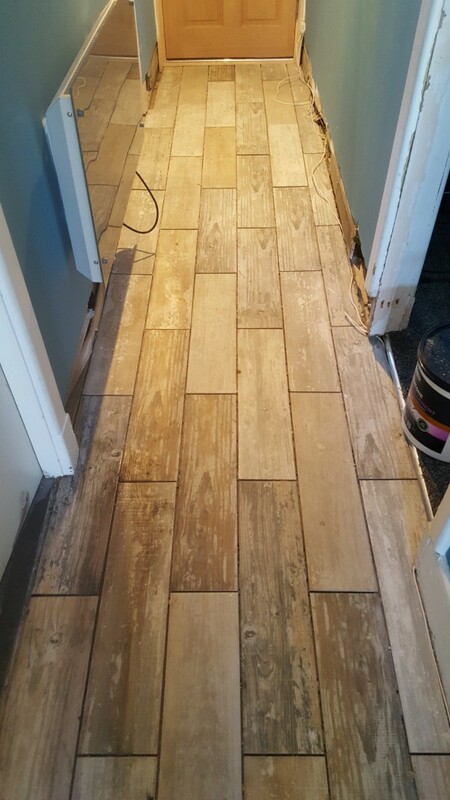 Grouting is relatively straight forward however it was made a little more complex as the grout had to be mixed with a dark gray grout powder to provide a better colour match with the tiles. 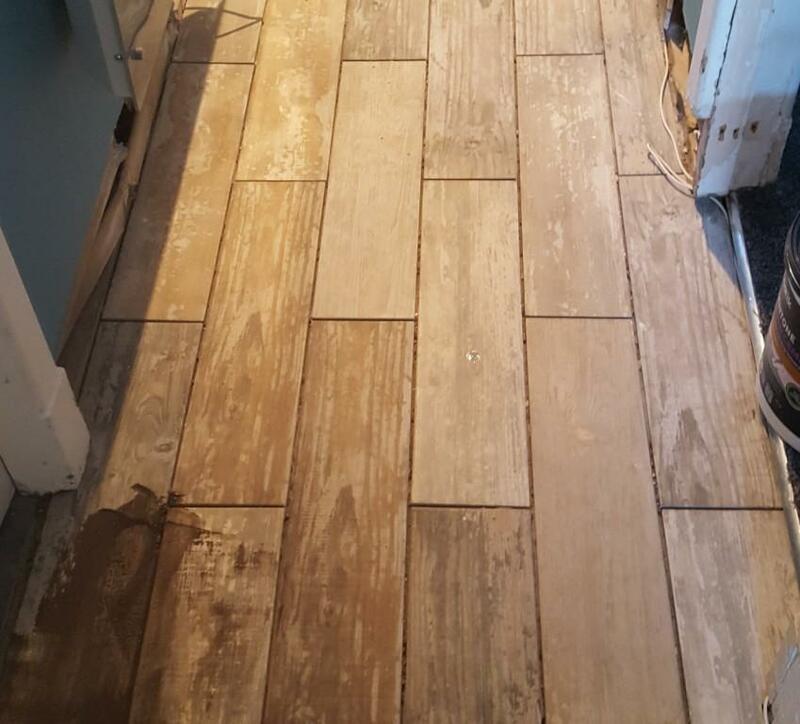 Once the grout batch was made up it was just a question of pushing it into the gaps between the tiles and the using a float the sponge to remove the excess grout from the tile. 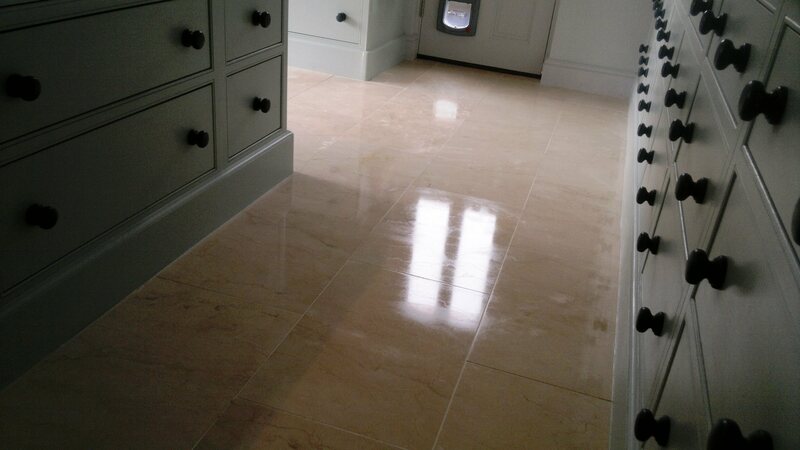 Once the grout had dried I washed the floor once more and left the happy customer. 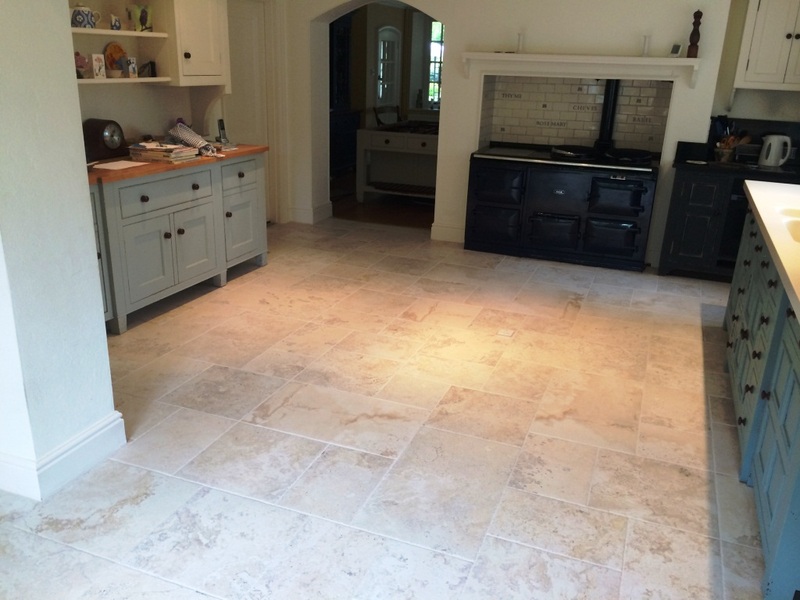 We were asked to take a look at these Marble effect Porcelain floor tiles installed in the Kitchen of a house in Maidenhead. 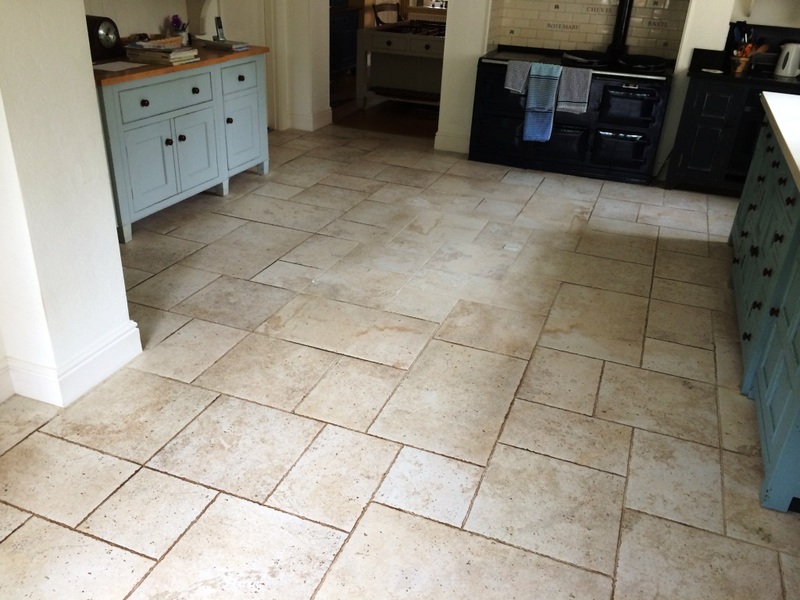 Porcelain are a very robust tile which unlike natural stone does not normally need a sealer; they can still become surface stained however especially in a kitchen but the grout is more likely to become stained than the tile which was certainly the case with this floor. 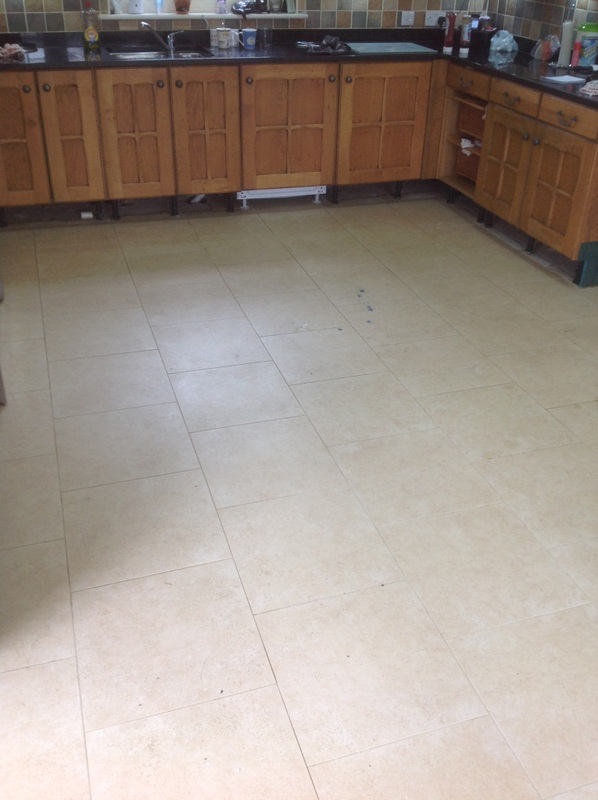 To get the Tile and Grout clean we applied a mild dilution of Tile Doctor Pro-Clean which was left to dwell and soak into the tile and grout for twenty to thirty minutes to help break down the oils, grease, skin fats, food fats and other soils which are found in the kitchen and stain the floor. 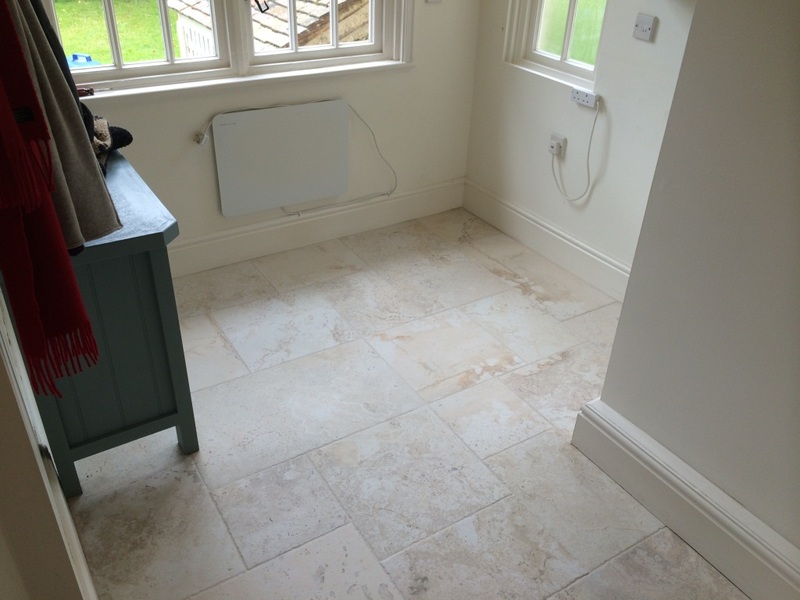 The solution was then worked into the tile using a heavy rotary machine fitted with a white pad and also manually into the grout using a stiff grout scrubbing brush. The next step was to remove the soiled cleaning solution and give the floor a good rinse and for this we have invested in a high pressure, hot water, vacuum system that has been installed in our van. 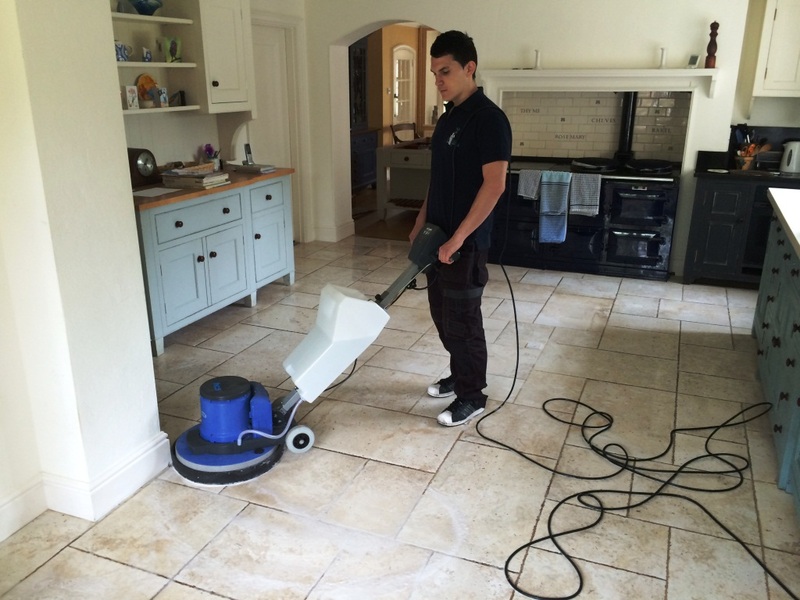 This tile and grout cleaning machine simultaneously extracts dirty solutions from the floor whilst blasting engrained soiling away from the grout and tiles. After deep cleaning and extraction the floor was allowed to dry for a period of 1 hour and an air mover was introduce to help encourage drying. 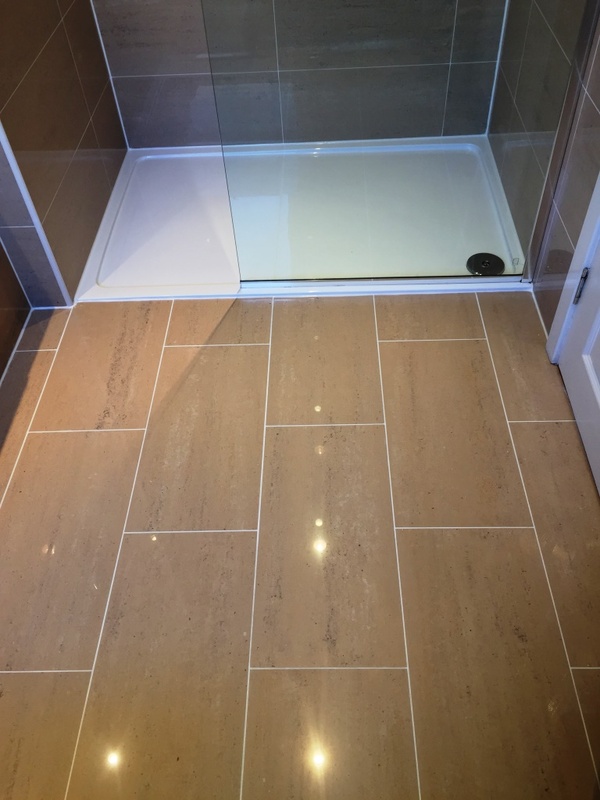 The Porcelain tiles were now looking fantastic and the grout improved however the trouble with grout is that it is porous, and so gets dirty quickly and is difficult to clean. 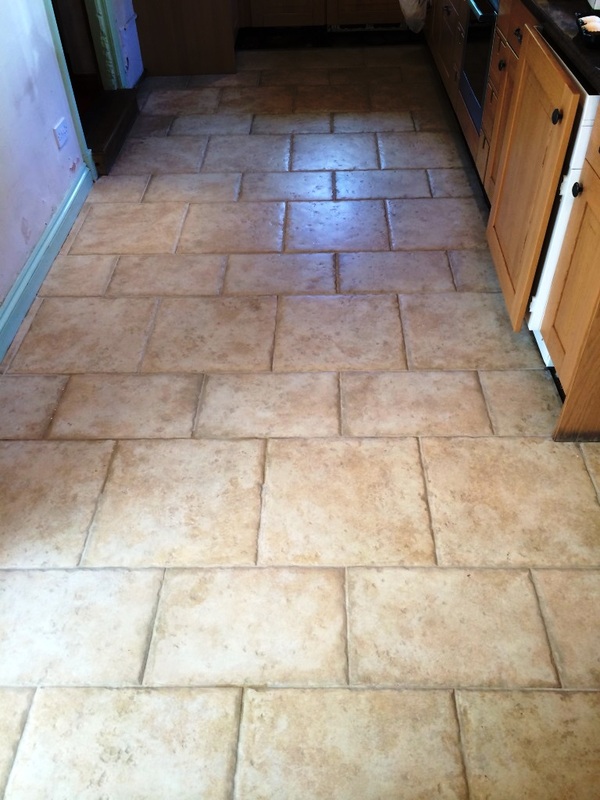 So to get the Grout back to the colour it once was we applied a Grout Colourant to the grout lines which not only restored the uniform appearance of the grout but also adds an impervious layer to the grout protecting it from staining and making it easy to clean going forward. 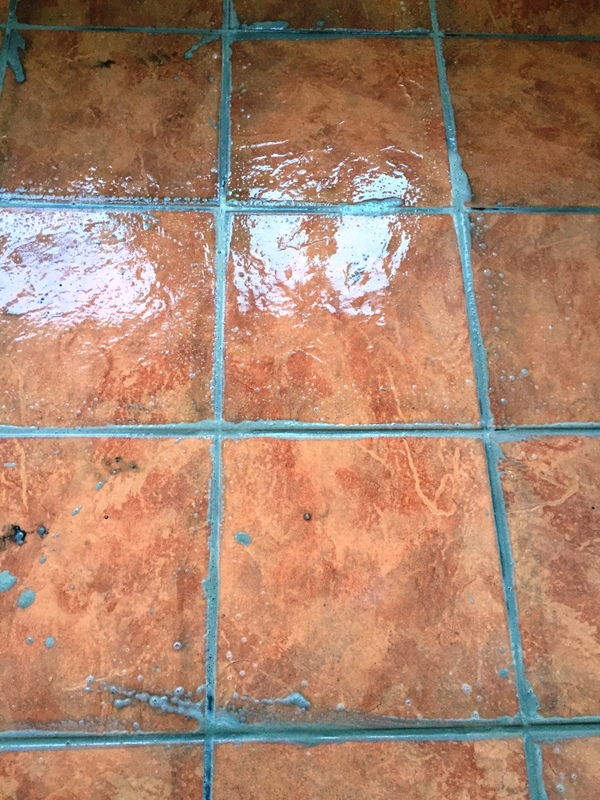 Like a sealer the grout colourant can be damaged through the use of aggressive cleaning products and heavy scrubbing so for aftercare I recommended the use of a mild cleaning solution such as Tile Doctor Neutral Tile Cleaner applied with a microfiber cloth to simply wipe the grout lines clean again. 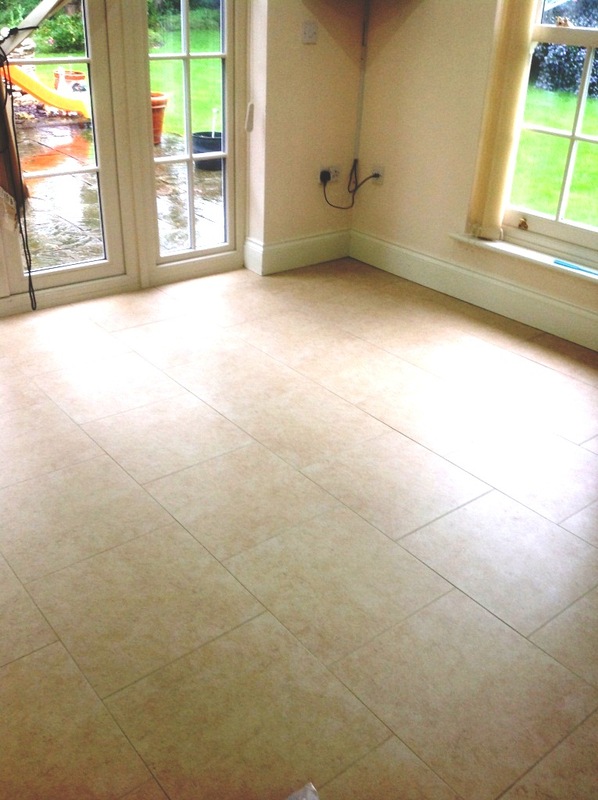 Most Porcelain tiles are non-porous making them an ideal floor covering especially in high traffic areas, the porcelain tiles fitted at this house in Gamlingay however featured small pits in the surface and over the years the pits had become engrained with dirt which proved difficult to clean. 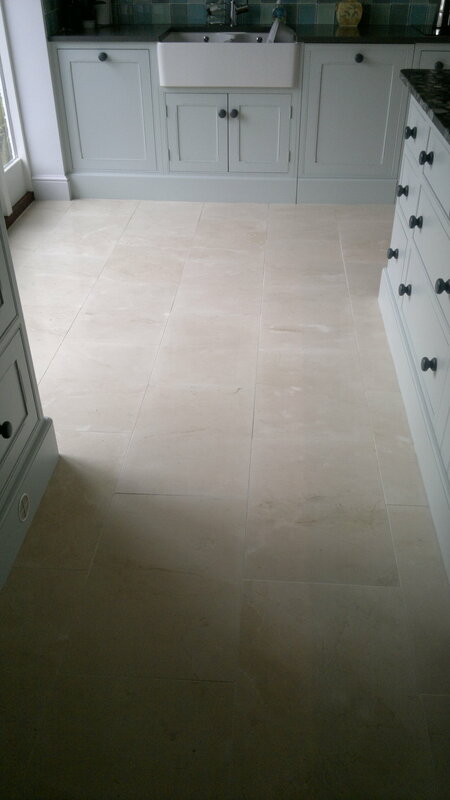 The porcelain tiles had been fitted throughout the ground floor and this was a reasonable sized house so it was going to take some time to clean. 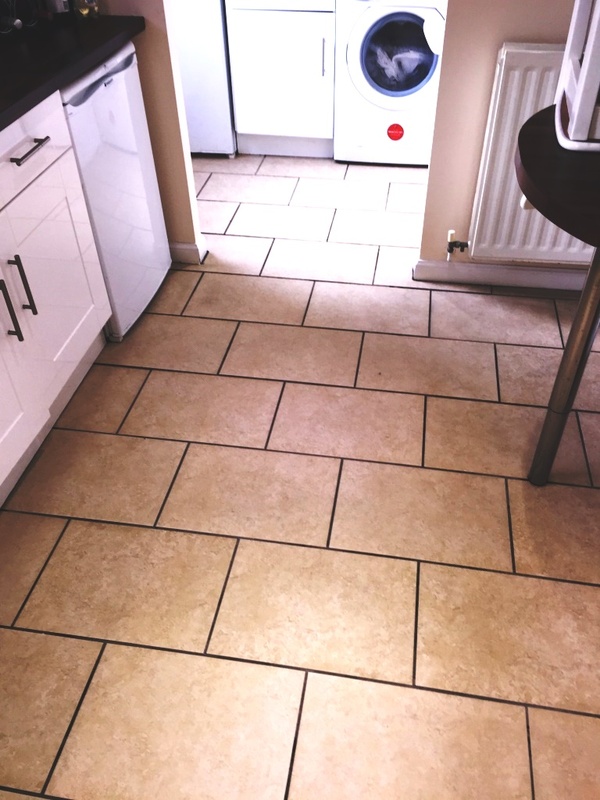 To speed the job up we use a lot of machinery which can cause splashing so the first job was to protect all the walls with plastic sheeting and in the kitchen we removed the kick boards. 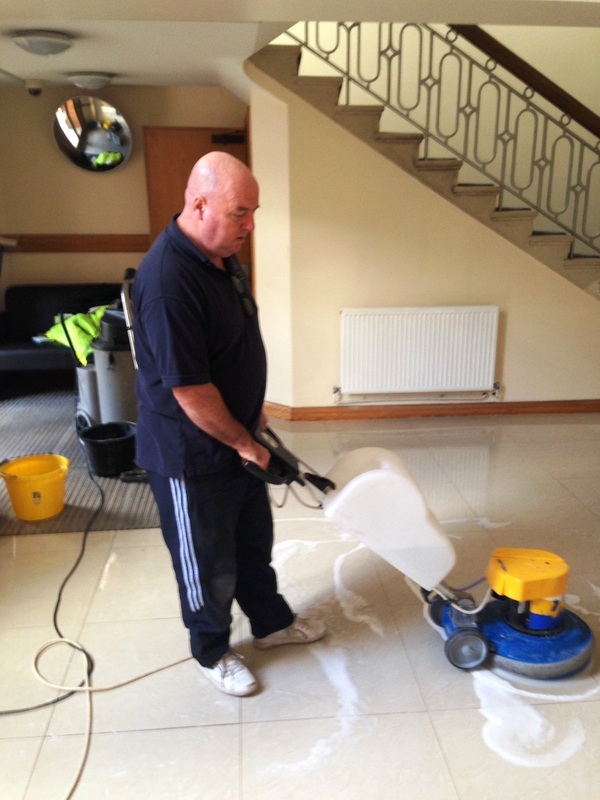 Working in sections the floor was wetted with a dilution of Tile Doctor Pro-Clean which was left to soak into the tile for twenty minutes to help break down the dirt before it was agitated and worked into the tile using a rotary machine fitted with a scrubbing pad. 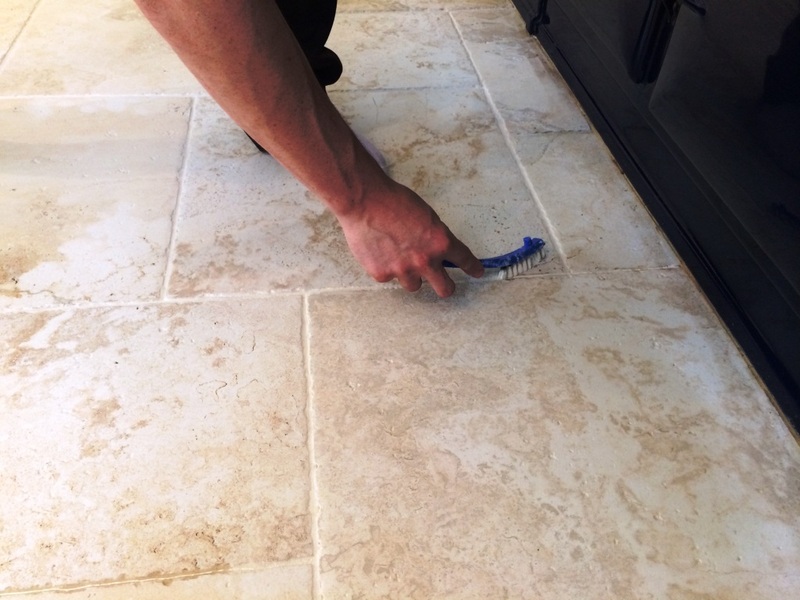 The combination of Pro-Clean and scrubbing action loosened the ingrained dirt leaving a dirty cleaning solution; scrubbing pads can struggle to reach the grout so this was scrubbed by hand using a stiff brush. 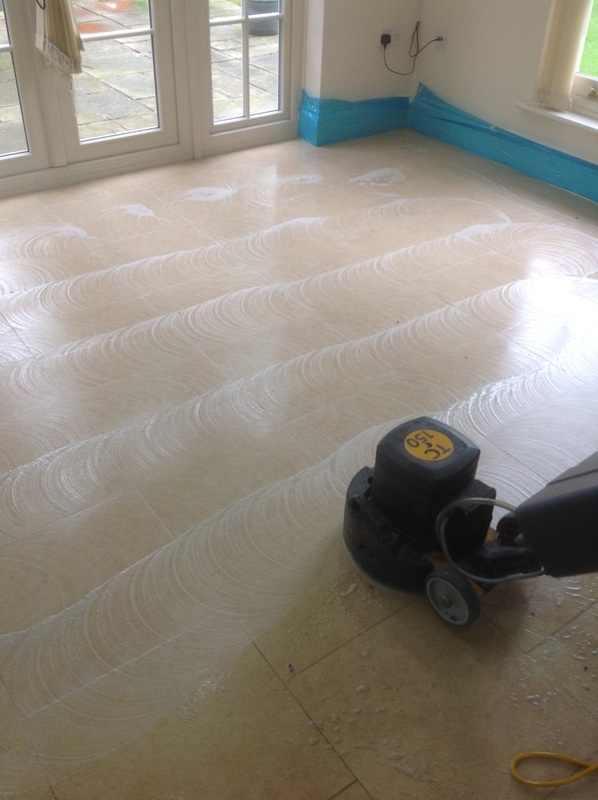 Stubborn areas were re-treated and once we were happy with that section of floor it was pressure cleaned using a special spinner tool which applies clean under pressure as well as simultaneously extracting liquids from the surface. This tool has the added advantage of neutralising the floor ensuring no trace of chemical is left behind that could upset a sealer. Cleaning took much of the day so by the time we finished it was getting quite late so we left allowing the floor to dry off overnight. We came back the next day to seal the floor and after checking the tiles had indeed dried we proceeded to apply Tile Doctor Ultra Seal which is an impregnating sealer designed to fill up the pores in the tile so contaminates cannot get it in, the other advantage of this particular sealer is it does not change the look of the tile. 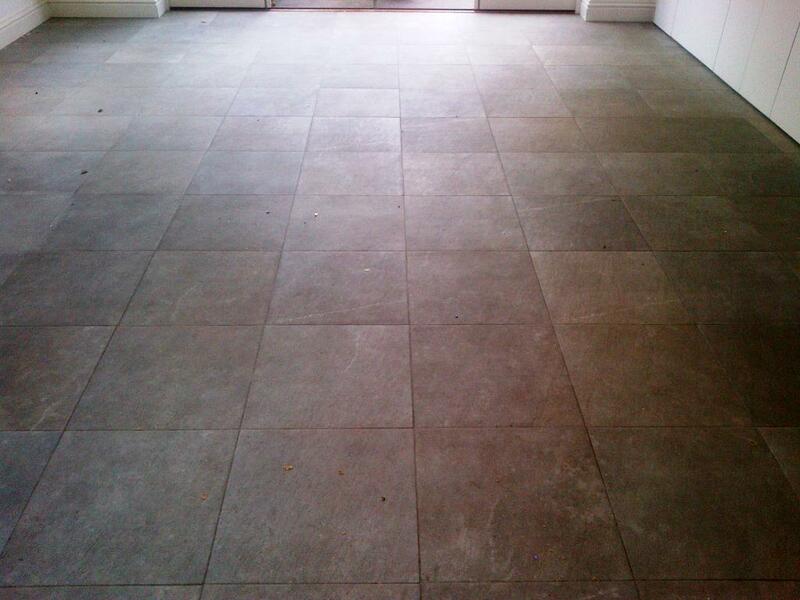 This Porcelain tiled floor was located in Hampton, Middlesex. 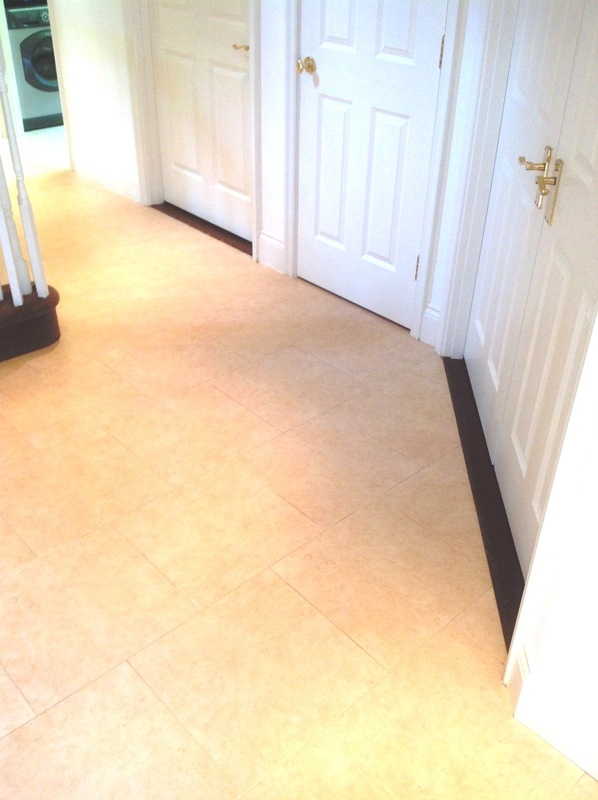 The floor had been newly laid a year ago and had not been sealed. 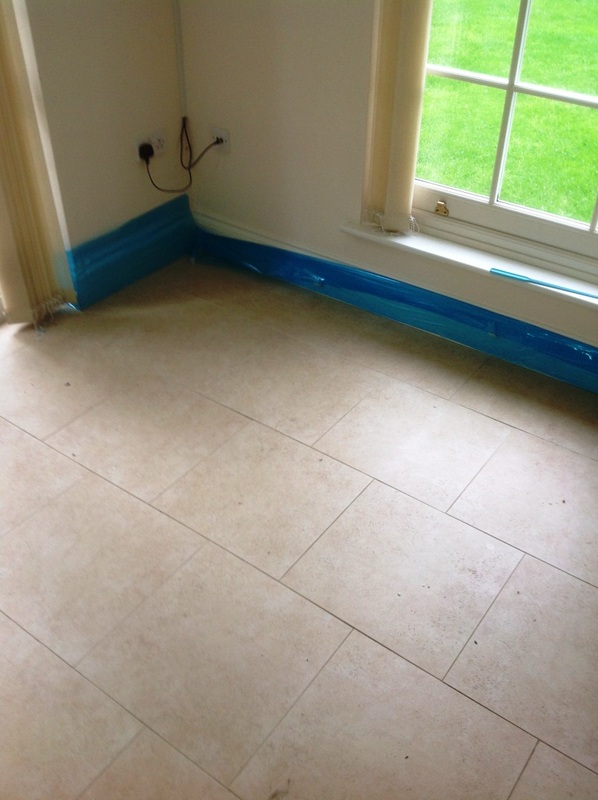 The Porcelain was of the semi porous variety and this type of Porcelain needs to be sealed to maintain its appearance and make maintenance easier. 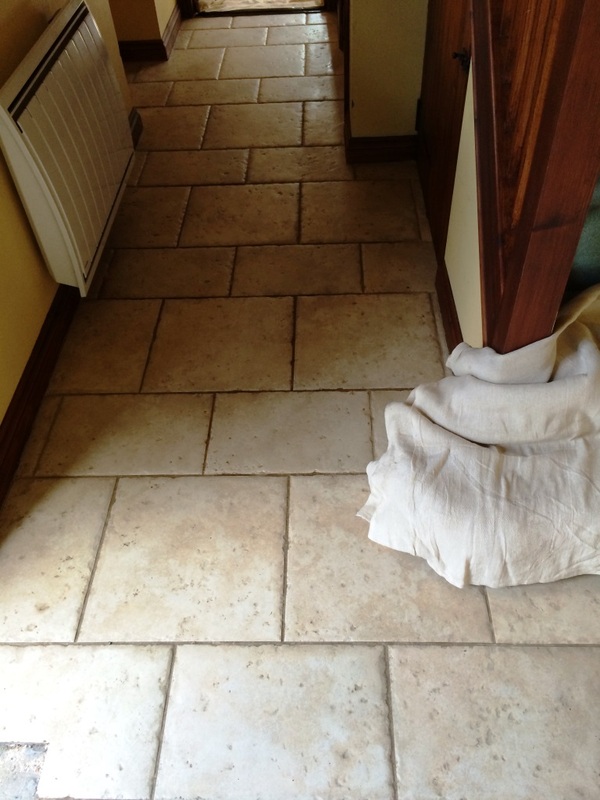 To make things worse the tiler had left a lot of grout residue on the surface of the tile which made the tile rougher, trapping the dirt and making it difficult to clean effectively. 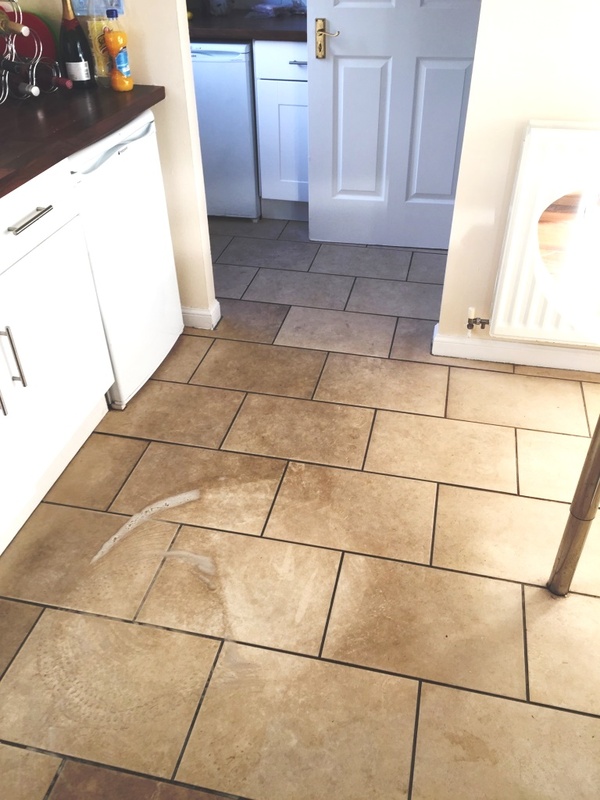 To remove the grout haze it was necessary to give the tile and wash with an acid product known as Tile Doctor Grout Clean-up, which is very effective at removing grout haze. Working in sections the product was diluted and then applied to the floor letting it soak in for a short while before being scrubbed in with a scrubbing pad fitted to a rotary machine. 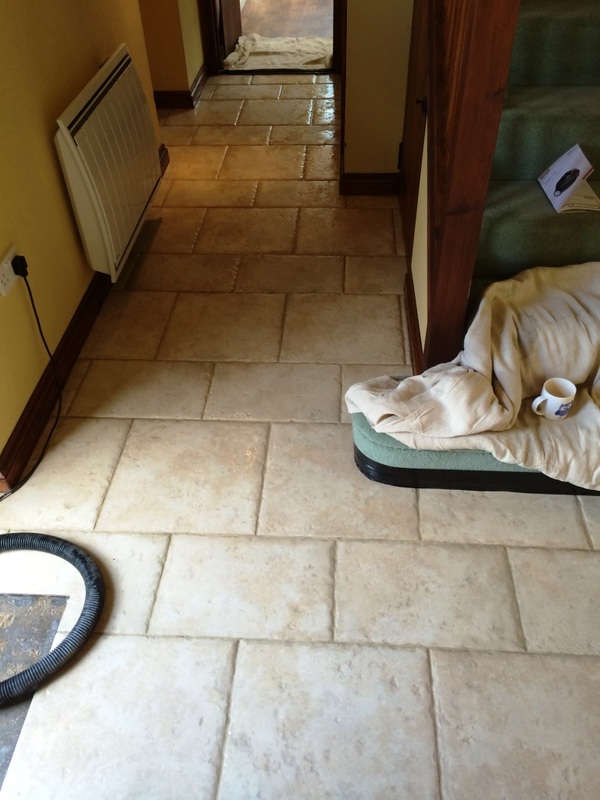 This action had the added bonus of cleaning the floor but you do have to be careful with acids no to leave them on the tile too long. 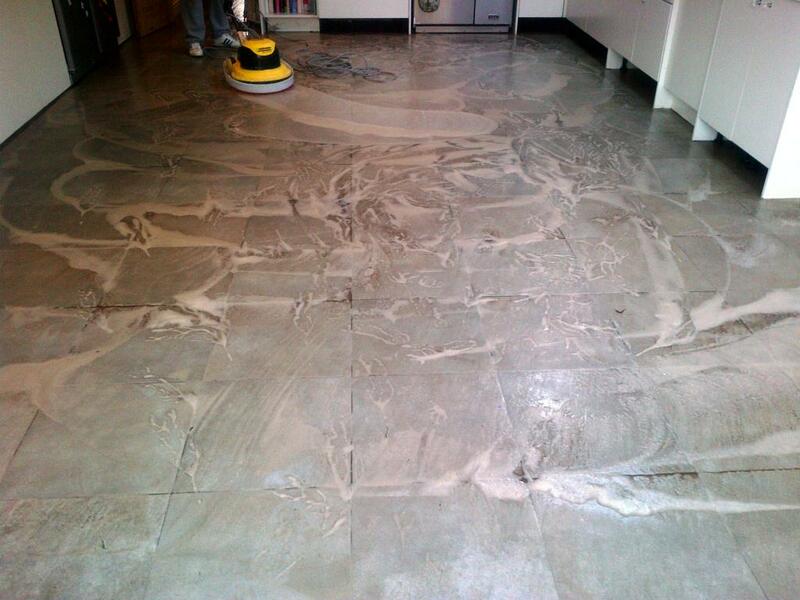 The soiled solution was removed using a wet vacuum and the tile rinsed down with clean water. 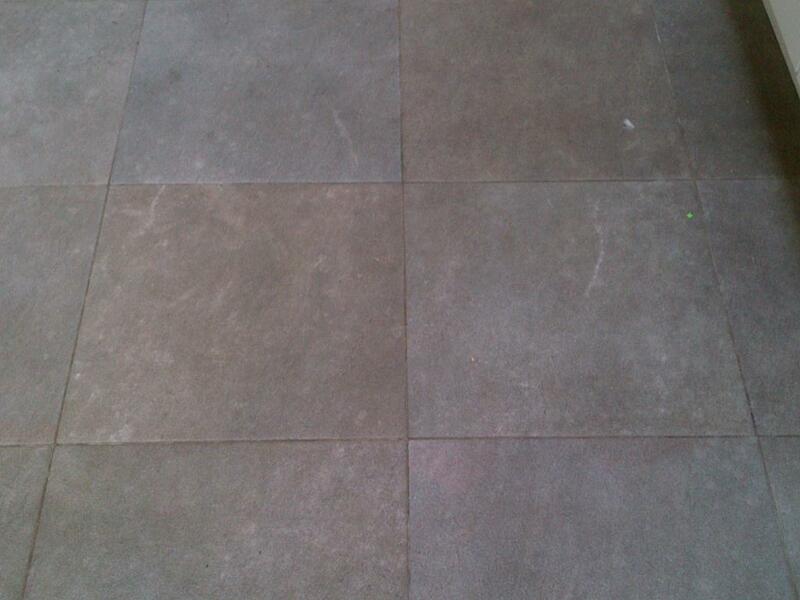 This process was repeated until I was satisfied the tile and grout was clear of grout residue. 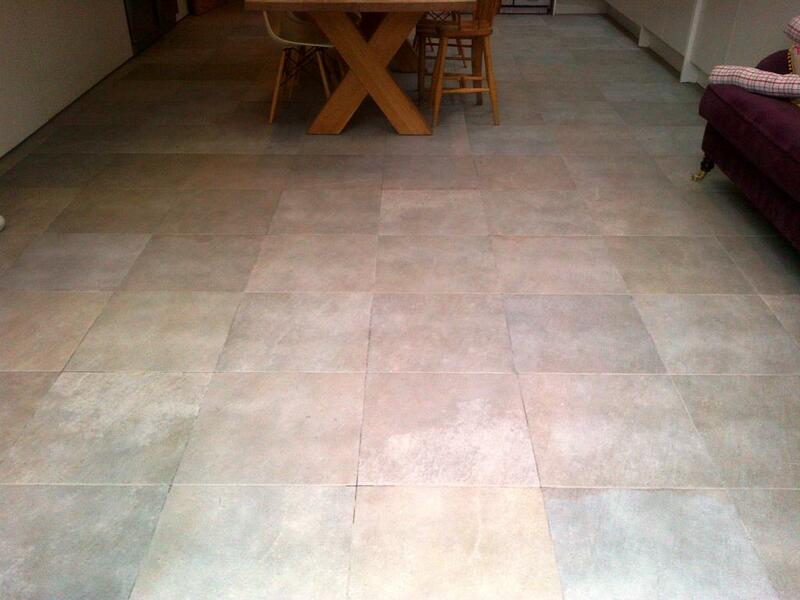 After allowing the floor to dry for 24 hours, we returned to seal the tiles with Tile Doctor Ultra-Seal which is a solvent based impregnating sealer that’s ideally suited for semi porous Porcelain and provides a natural look. 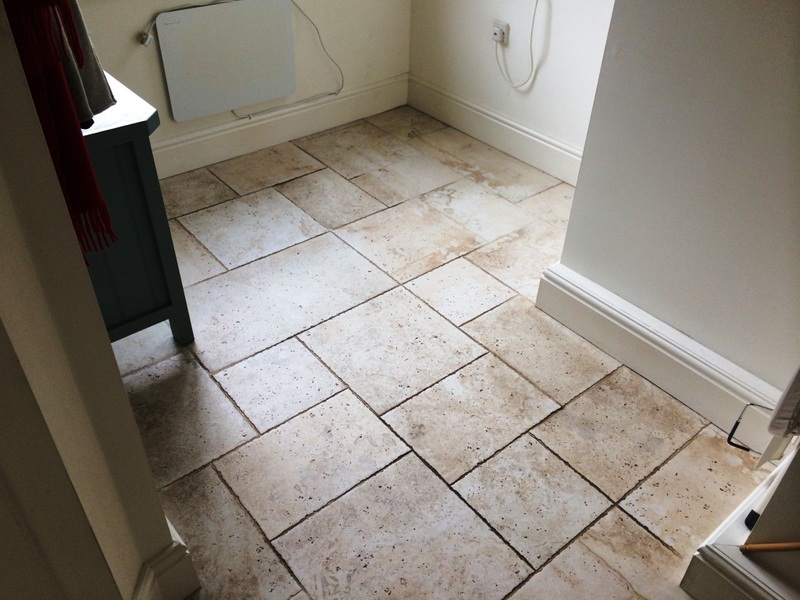 I took the photograph above between sections so you could see the difference between the before and after and I think you will agree the treated tiles look much cleaner. 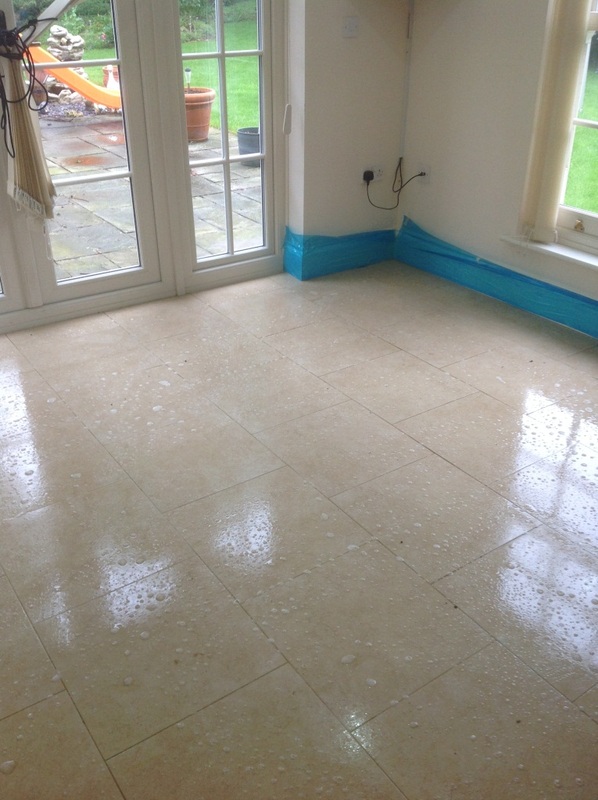 Our customer in Beaconsfield had been having great difficulty cleaning a textured Porcelain tiled floor that was installed in the kitchen and adjacent dining room; despite numerous attempts whatever she tried never have the desired effect. 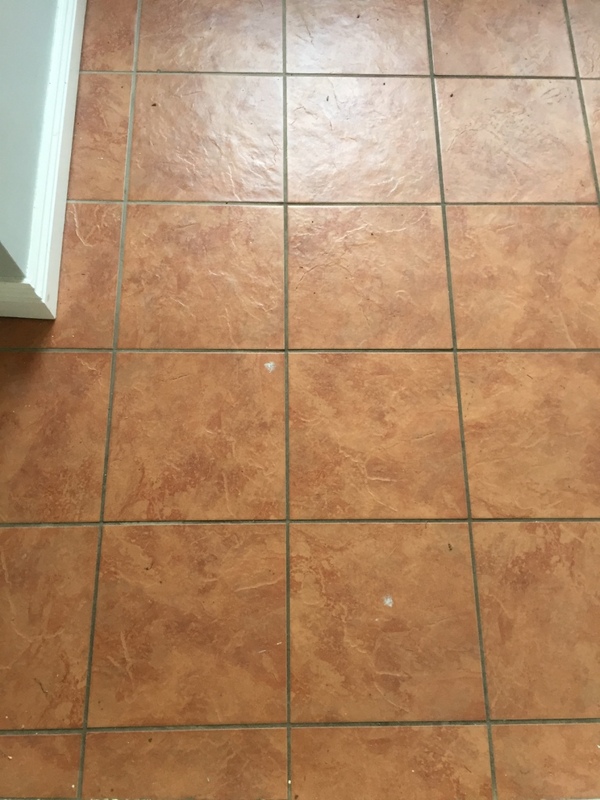 During the home survey we demonstrated on a single tile how using our cleaning agents we could remove the soiling and restore the original colour of the tile which hadn’t been seen for a number of years. 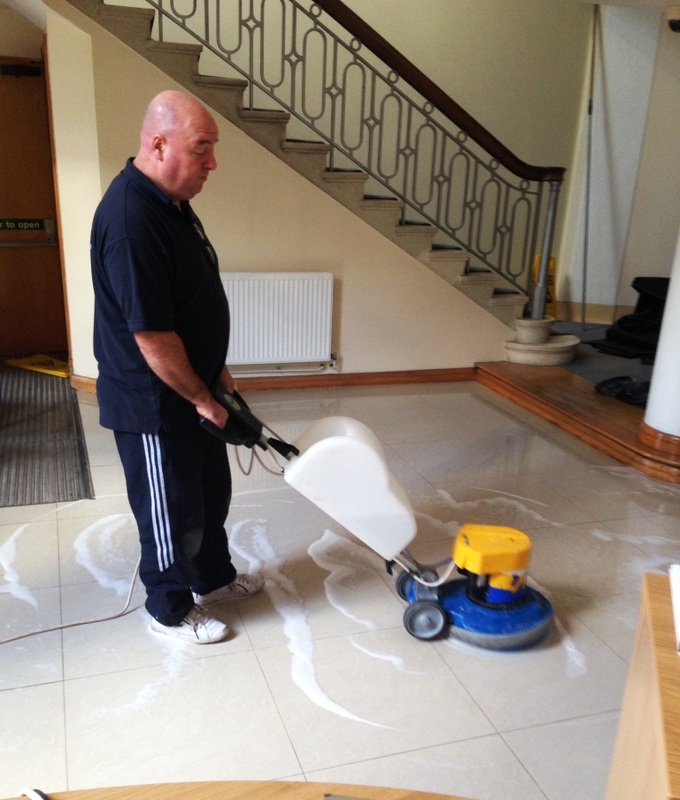 Equal amounts of Tile Doctor Pro-Clean combined with Tile Doctor NanoTech UltraClean was spread evenly throughout the floor and worked in with a rotary machine fitted with a scrubbing pad running at slow speed. 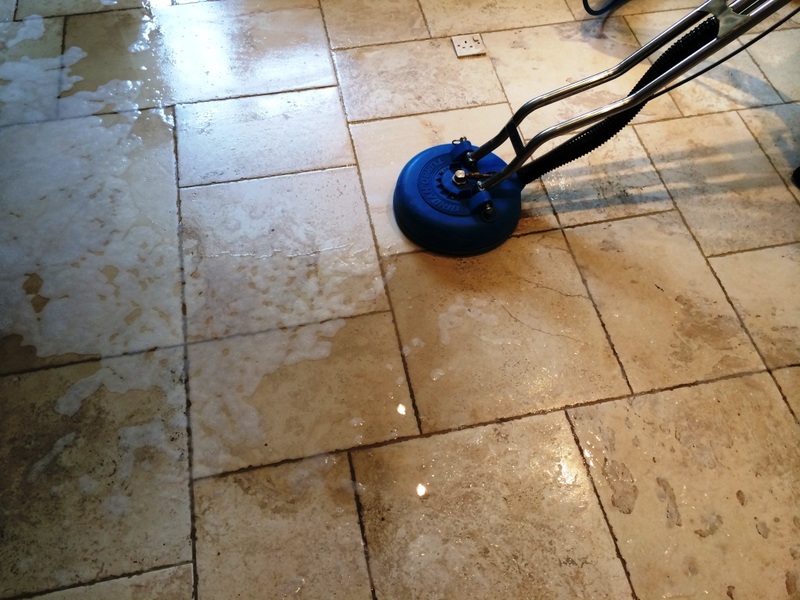 The tiny abrasive particles in the cleaning solution worked deep into the tile to bring out the dirt so once the whole floor was treated in this manner we switched to the next machine. The next machine we used was a truck mounted device that directs hot water onto the tile at high pressure using a second hose to remove the soiled solution back to a storage tank in the van. 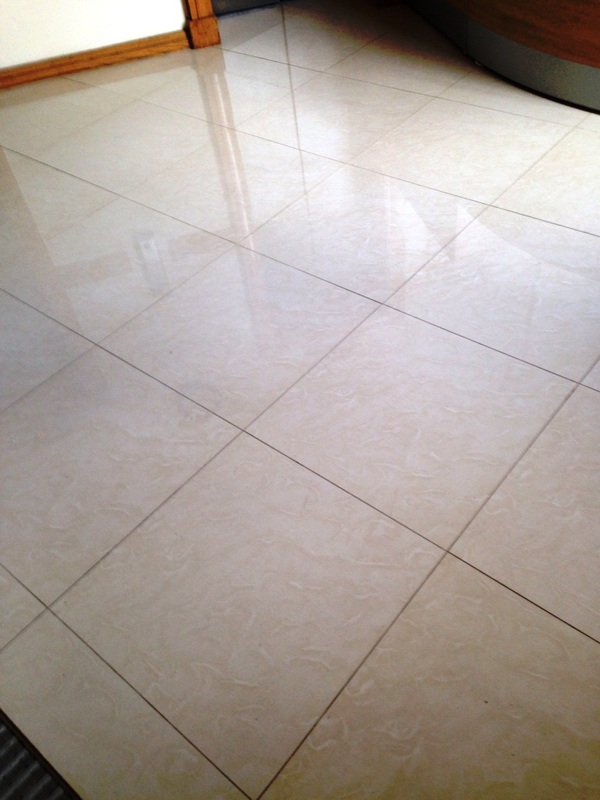 It’s a very effective machine that has an instant effect on the tile. 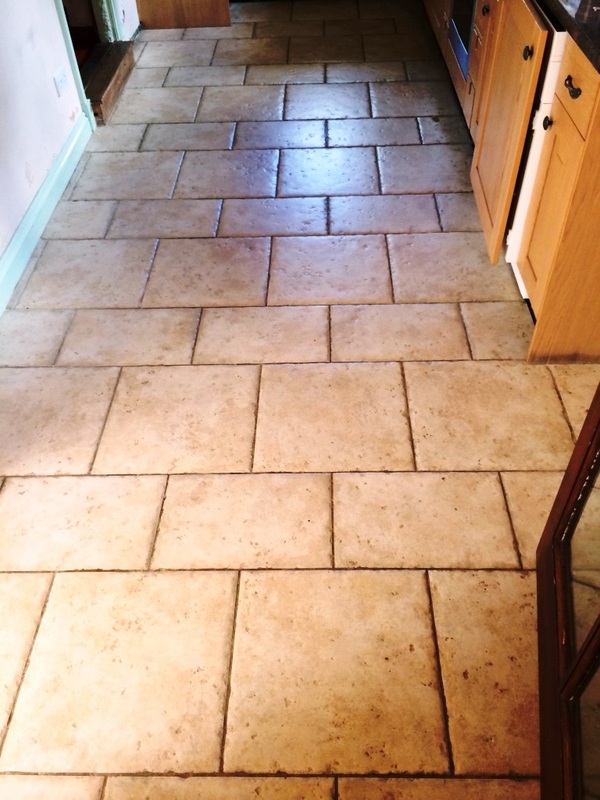 Once this process was completed we scrubbed out the grout lines using a mix of Tile Doctor Grout Clean-Up which did a good job of cleaning the grout and also removed any soiling left from our previous clean. 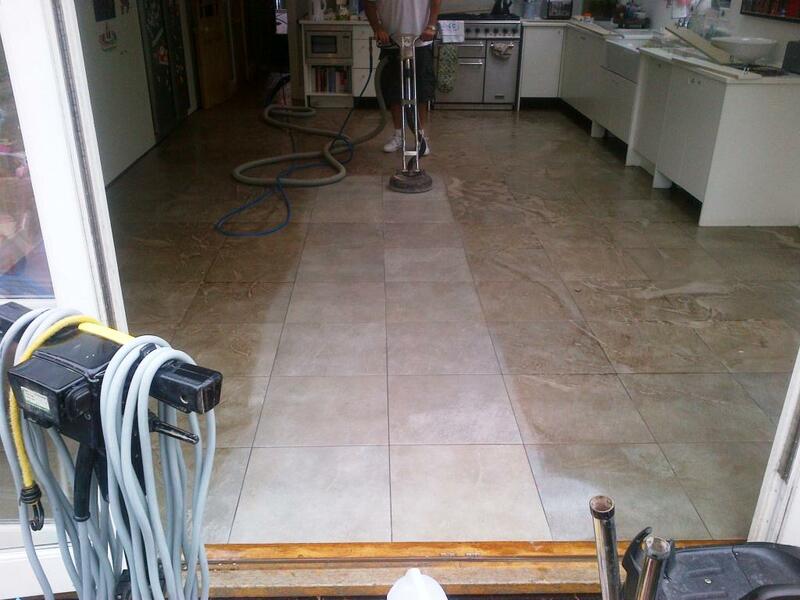 Once this was done we gave the floor a final clean and rinse and then left to dry overnight. 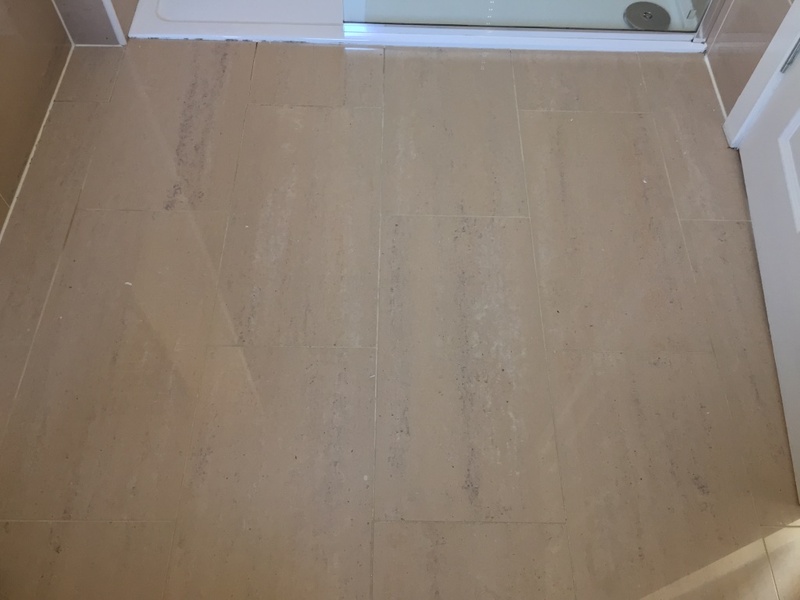 Most porcelain tiles like ceramics won’t take a sealer however Micro-Porous Porcelain tiles do need sealing due to their porosity so we came back the 2nd day to apply two coats of Tile Doctor Seal And Go which will protect the tile from staining and aid the future maintenance. 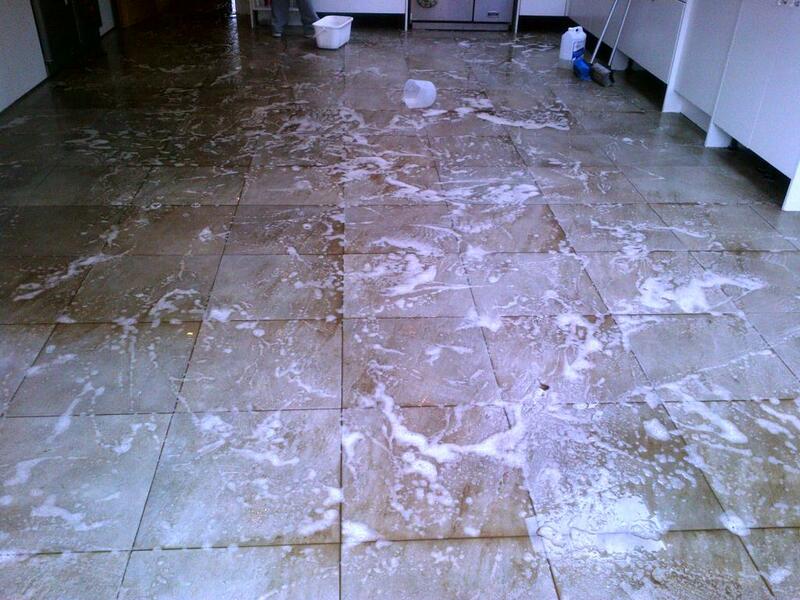 I should mention that we recommended the use of Tile Doctor Neutral tile cleaner for regular maintenance; its neutral PH formula is ideal for sealed floors as domestic acidic cleaners will eat away at the sealer over time and reduce its life. 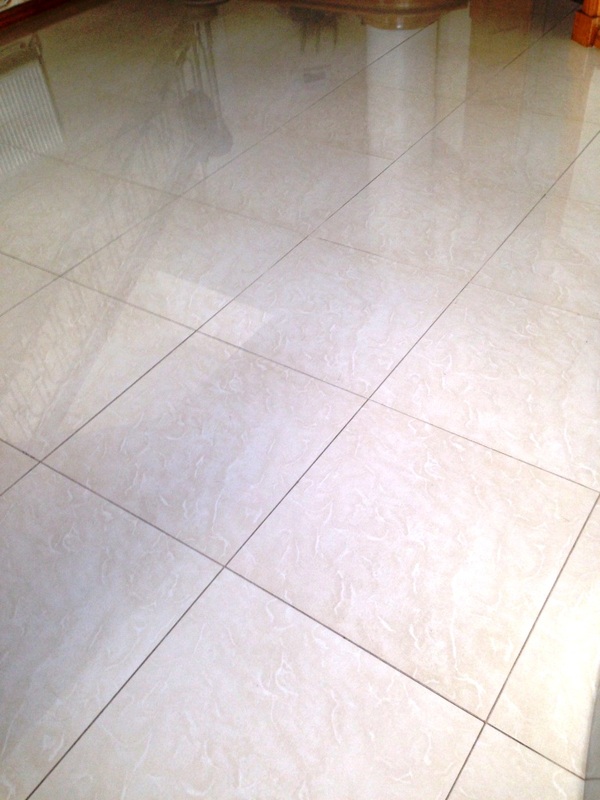 These Porcelain floor tiles had been laid in the hallway of a block of flats in Luton and had seen a fair amount of foot traffic resulting in the usual build-up of dirt and grime making it well overdue for a deep clean. To clean Porcelain tiles I would normally just apply Tile Doctor Pro-Clean however given the amount of dirt in the tile we needed all the help we could get so the Pro-Clean was mixed 50/50 with NanoTech Ultra Clean which results in the creation of a powerful tile cleaner that contains Nano sized abrasive particles that can penetrate deep into the dirt. 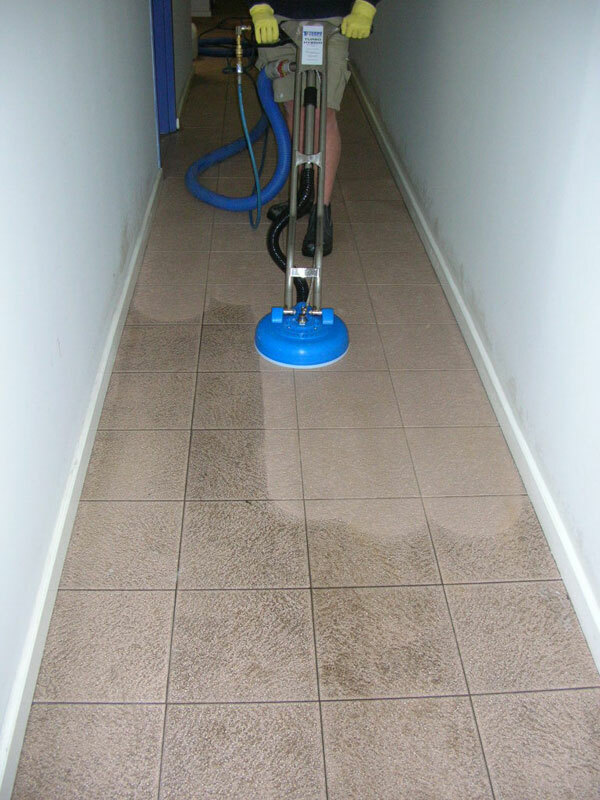 The cleaning solution was left to dwell on the surface of the tile for twenty minutes before scrubbing the floor with rotary machine fitted with a black scrubbing pad. You could see the dirt coming out of the floor at this point so once the whole floor was scrubbed I switched to a Rotovac machine which applies and removes water at high pressure to remove the soil and rinse the floor at the same time. 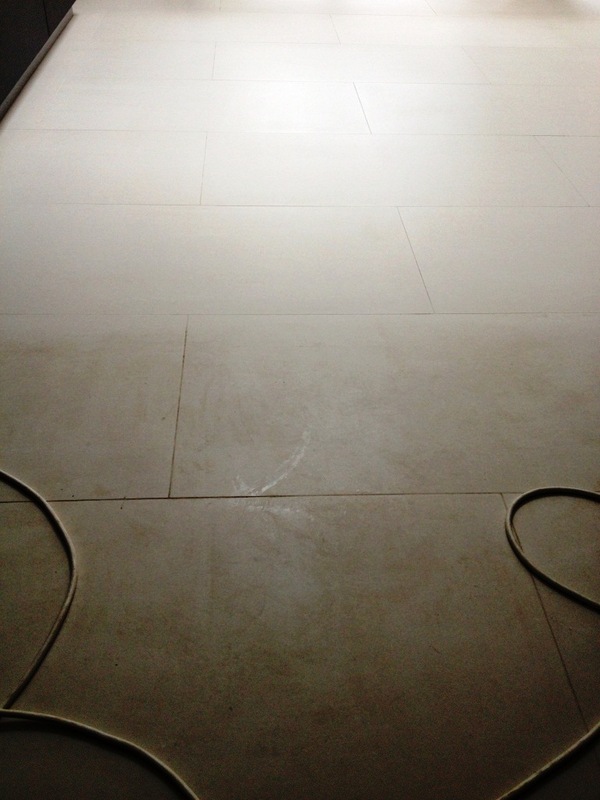 You can see from the photograph above which was taken with the Rotovac machine in use the difference in the tiled floor.